The CLA is set to establish a new segment, with world-leading aerodynamics (Cd = 0.22), avant-garde coupé design and 4MATIC all‑wheel drive (optional). As a new four-door coupé it follows the idea of the CLS, whose design concept has spawned more than its fair share of imitators since its debut in 2003. With its frameless doors, the coupé adopts the design of the Concept Style Coupé into series production. The newcomer features a radar-based braking system (COLLISION PREVENTION ASSIST) as standard which is able to warn the driver of an obstacle from a speed of 7 km/h and to initiate precision braking when the driver steps on the brake pedal. The new CLA is available for ordering with immediate effect and will be delivered to dealerships in April. 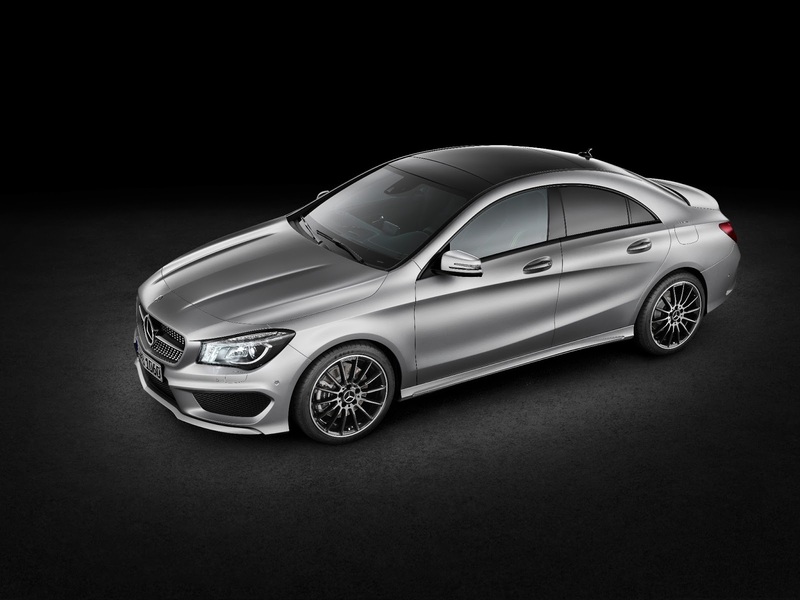 Prices begin at 28,977 euros for the CLA 180. "The response to the Concept Style Coupé was overwhelming. The most frequent comment by far was 'Please put this car into series production.' That's precisely what we are doing now," notes Dr Dieter Zetsche, Chairman of the Board of Management at Daimler AG and Head of Mercedes-Benz Cars. "The CLA is a car that does not confuse 'middle range' with 'middling quality'. 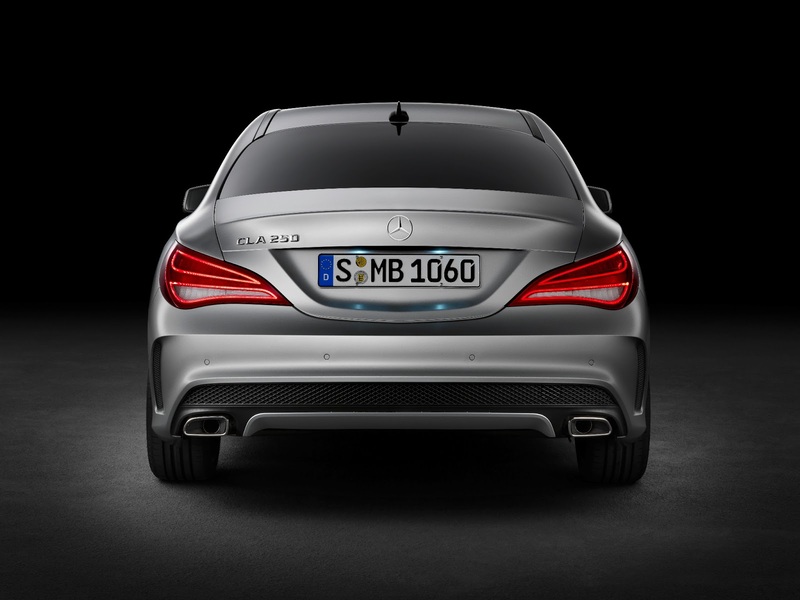 Its sporty design underscores the sporty side of the Mercedes-Benz brand." In keeping with its sporty positioning, the CLA is available with high-torque turbo engines rated at up to 155 kW (211 hp), sports suspension and 4MATIC all-wheel drive. The technical highlights of this new design icon include a new world record in aerodynamics for series production automobiles (Cd value: 0.22) and numerous driving assistance systems, including advanced COLLISION PREVENTION ASSIST. This radar-based assistance system provides the possibly distracted driver with visual and acoustic warnings of identified obstacles and prepares Brake Assist for precision braking. Braking is initiated as soon as the driver steps emphatically on the brake pedal. When an impending danger of collision is identified, COLLISION PREVENTION ASSIST calculates the precise braking force ideally needed to avoid an accident and makes the best possible use of any distance remaining. As a new feature, COLLISION PREVENTION ASSIST affords protection from typical rear-end collisions in dangerous traffic situations in the CLA from a speed of only 7 km/h (previously: over 30 km/h). Five lines and packages which vary greatly in character are available to individualise the striking compact mid-range coupé (length/width/height: 4630/1777/1437 millimetres). In keeping with the digital lifestyle of the CLA's social media-savvy target group, smartphones can additionally be fully integrated into the vehicle's display and operating system. 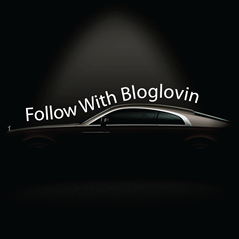 Following a brief appearance on the eve of the NAIAS in Detroit (14 to 27 January 2013), the CLA will have its official world premiere at the Mercedes-Benz Fashion Week in Berlin (15 to 18 January 2013). 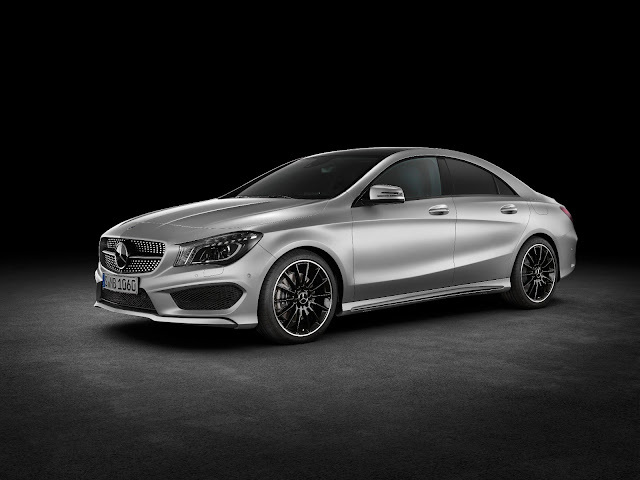 The new CLA is available for ordering with immediate effect and will be delivered to dealerships in April. Its breathtakingly sporty proportions and powerfully dynamic design idiom featuring an interplay between concave and convex surfaces give this four-door coupé its unmistakable look. The CLA adopts the avant-garde design of the Concept Style Coupé into series production almost 1:1. The vehicle's striking features include the bonnet embedded in the front end with powerdomes and the diamond radiator grille. The light modules and LEDs behind the headlamp cover glass have been arranged in such a way as to create the characteristic "flare effect" for the daytime driving lights and indicators. 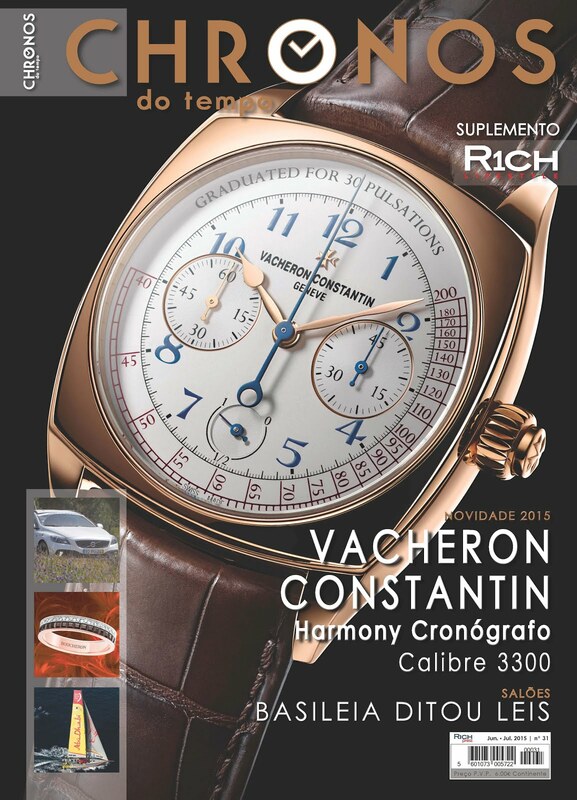 This light signet defines the car's energetic appearance and shapes a new, youthful Mercedes face. Numerous details indicate that on a design level the CLA represents a further development of the modern classic Mercedes-Benz CLS. Three prominent lines give structure to the vehicle when viewed from the side: the front structural edge over the wings flows towards the rear end in a characteristic dropping line. Another, more sinewy line spans the shoulder muscle above the rear axle, while the third feature line extends in a sweeping curve from the front wheel towards the rear. Together, these lines lend depth and dynamism to the side profile. The width-emphasizing rear end exudes power and athleticism, featuring an interplay betweeconvex and concave surfaces and edges. 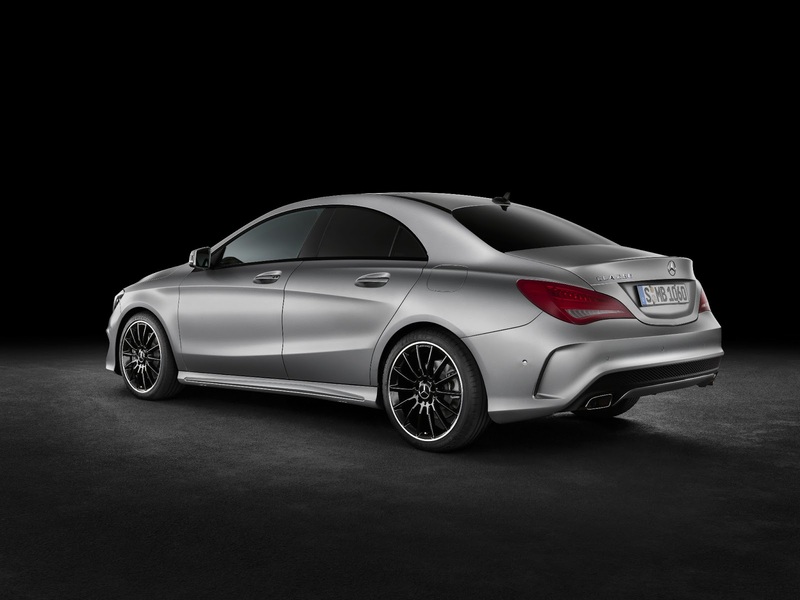 The gently sloping roof contour and the pronounced, hallmark curvature of the rear window provide the CLA with a coupé-style character from the rear, too. The athletic impression from the rear results from the drawn-in C-pillars in conjunction with the shoulder muscle over the rear wheel arch linings. The tail lights are framed by the muscular lines of the shoulders which extend into the rear end, the horizontal orientation of the lights emphasizing the rear's powerful and aesthetic breadth. The light functions feature an arrow-style arrangement. 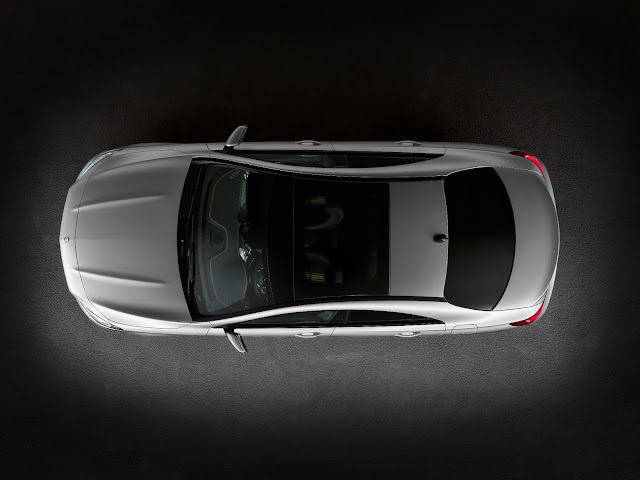 A large panoramic sliding sunroof is optionally available. This sunroof consists of a fixed polycarbonate cover at the front, a moving element made of mineral crystal and side trims to match the glass look. As such, the glass surface then extends from the front windscreen to the rear window. The exterior's progressive, sporty appearance is continued inside the vehicle. The interior additionally derives a very special quality feel from the design idiom, the selection of high-quality materials and the available combinations of materials. All trim surfaces are galvanised, resulting in a metallic finish. The instrument panel incorporates five round vents. The outer rings of the round vents have a high-quality electroplated finish. The airflow direction is governed by a galvanised insert that reveals a meticulous attention to detail. The free-standing display screen features a black piano-lacquer-look front panel and a flush-fitting silver frame. 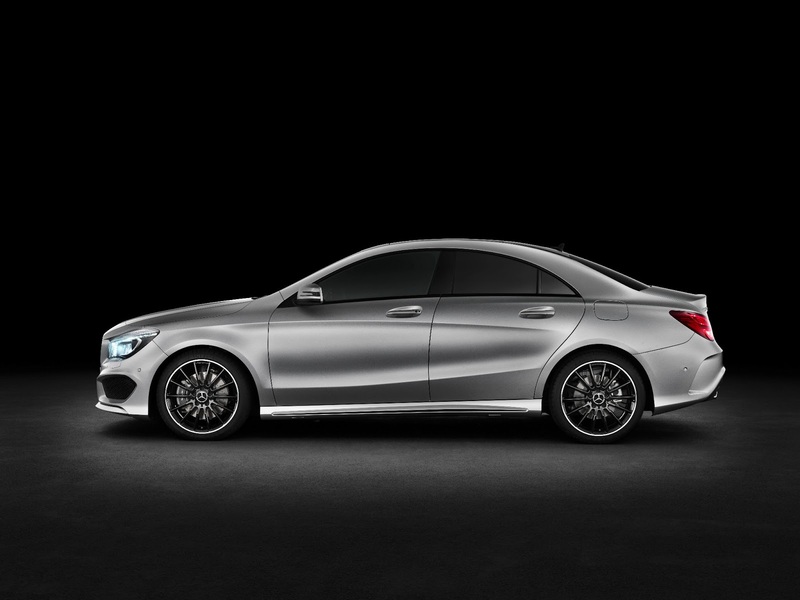 The CLA is fitted with integral seats in the front and rear, underscoring its sporty character. The rear bench seat emphasizes the outer seats (2+1-seater). Coloured contrasting stitching is available, according to the selected interior appointment options. A fibre-optic cable in the opening between head restraint and backrest is optionally available as part of the ambient lighting. With a Cd value of 0.23, the CLA sets a new benchmark – both within the Mercedes-Benz model range and among all production vehicles. The drag area, Cd x A -which is crucial to aerodynamic resistance – also leads the field, at 0.51 m². This already record figure is undercut still further by the CLA 180 BlueEFFICIENCY Edition, which will be launched in June and is also available to order with immediate effect. In this case the Cd figure is 0.22, while in terms of wind resistance the four-door coupé manages to breach another magic barrier: the figure here is just 0.49 m². The good air flow characteristics, which are a major contributory factor to the vehicle's low fuel consumption in everyday conditions, result from numerous aerodynamic optimisation measures. These include a low A-pillar shoulder with adapted A-pillar geometry, aerodynamically optimised exterior mirrors, wheel trims designed for low aerodynamic drag and serrated wheel spoilers on the front and rear wheel arches. Extensive underbody panelling, additional panelling in the middle area of the rear axle and an aerodynamically optimised rear silencer followed by a diffusor improve the flow of air under the underbody. 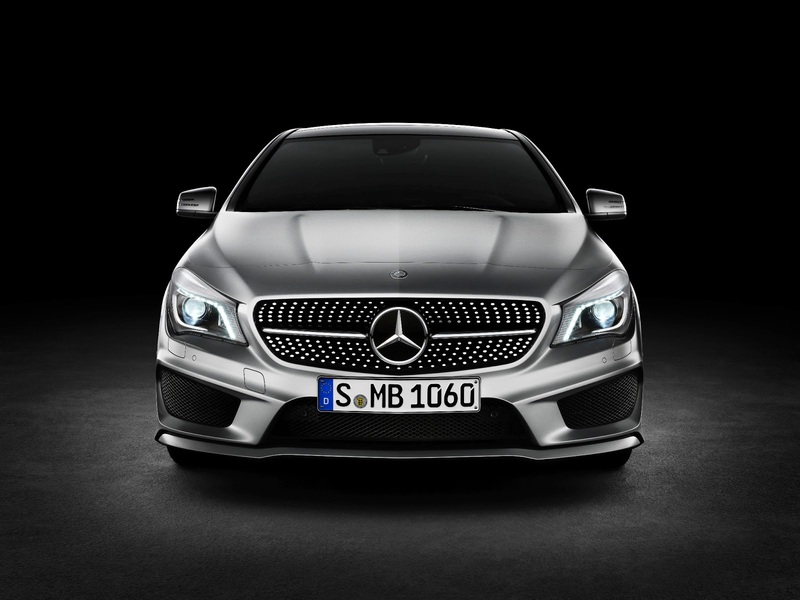 Numerous driving assistance systems offer support in the CLA and reduce the driver's workload. Standard-fit features for the coupé include ATTENTION ASSIST drowsiness detection and radar-based COLLISION PREVENTION ASSIST with adaptive Brake Assist, which now helps to protect the CLA from collisions from a speed of only 7 km/h (previously: over 30 km/h). This feature combines with DISTRONIC PLUS to become COLLISION PREVENTION ASSIST PLUS, incorporating an additional function: when a danger of collision persists and the driver fails to respond, the system is able to carry out autonomous braking at speeds of up to 200 km/h, thereby reducing the severity of collisions with slow or stationary vehicles. The system also brakes in response to stationary vehicles at a speed of up to 30 km/hand is able to prevent rear-end collisions at speeds of up to 20 km/h. Established assistance systems, such as the Lane Tracking package with Blind Spot and Lane Keeping Assist or Adaptive Highbeam Assist, are also available for the CLA. Active Parking Assist (option) enables automatic parking in lengthways and crossways parking spaces. The chassis of the CLA features a McPherson front axle and an independent multilink rear suspension, featuring three control arms and one trailing arm per wheel. 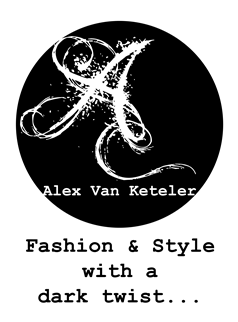 This means that longitudinal and lateral dynamics are virtually independent of one another. A CLA-specific feature is the flexible decoupling of the rear axle carrier, which benefits ride comfort. Wheel carriers and spring links consist of aluminium, in order to reduce the unsprung masses. Two chassis and suspension set-ups are available: the comfort suspension and the optional sports suspension for sporty yet comfortable handling. The latter entails lowering of the body by 20 mm (front) and 15 mm (rear). Irrespective of the selected chassis, all CLA variants come with the Direct Steer system. This electromechanical power steering offers improved feedback to the driver in comparison to conventional systems regarding the prevailing driving conditions and makes an important contribution towards overall efficiency, as the steering assist function only requires energy when steering is actually carried out. It additionally enables various steering assistance functions which are activated by the ESP® control unit. These include countersteering in case of oversteering, corrective steering when braking on road surfaces offering different levels of grip (split-friction braking), mitigation of the extent to which the front-wheel drive influences the steering and compensation of crosswind and road gradients. The CLA from Mercedes-Benz is optionally available with a new generation of the 4MATIC permanent all-wheel drive system featuring fully variable torque distribution. Similarly to the other 4MATIC versions, this completely new development boasts high tractive power reserves and outstanding agility combined with superlative driving safety and energy efficiency. The components of the new 4MATIC include the power take-off to the rear axle which is integrated in the 7G-DCT automated dual clutch transmission and the rear-axle gear with integrated, electrohydraulically controlled multi-disk clutch. This set-up enables fully variable distribution of the drive torque between front and rear axle. Additional benefits of this design are a lower system weight than is available from the competition and high efficiency. A year ahead of the scheduled introduction of the Euro 6 in 2014, all petrol-engine variants and the top diesel variant of the new Mercedes-Benz CLA already meet the future requirements of this European emissions standard. The petrol engines with a displacement of 1.6 and 2.0 litres cover an output spectrum ranging from 90 kW (122 hp) in the CLA 180 through 115 kW (156 hp) in the CLA 200 to 155 kW (211 hp) in the CLA 250. The two diesel engines combine dynamic low-end torque with the utmost efficiency: the CLA 200 CDI generates 100 kW (136 hp), with maximum torque of 300 Nm (available from the 3rd quarter of 2013). With a cubic capacity of 2.2 litres, the CLA 220 CDI will offer an output of 125 kW (170 hp) and 350 Nm of torque, emitting only 109 g CO2 per kilometre. All the engines feature the ECO start/stop function as standard. The engines are combined with a six-speed manual transmission or with the 7G-DCT dual clutch automatic transmission, which reconciles comfort and sportiness in inimitable fashion. The latest multimedia generation deployed in the CLA boasts new functions, additional apps and a modified graphic colour scheme. Daimler's Digital Drive Style app concept, which together with the Drive Kit Plus for the iPhone® enables seamless integration of the iPhone® into the vehicle, has been extended. The highlights include Siri voice control and Glympse real-time location sharing. Glympse enables the user to share his or her current location with selected persons. Other functions are Facebook®, Twitter®, internet radio, AUPEO!™ Personal Radio and the advanced navigation solution from Garmin® with web-based real-time traffic information, online special destination search including Street View™ and 3D map display. The COMAND Online multimedia system has also been extended. The latest generation offers improved, photo-realistic map display, an additional Bluetooth® profile (to enable the internet to be accessed by iPhone®, for example), the display of images additionally in bmp and png formats and the real-time transfer of traffic data.